Harry Vardon was undoubtedly the greatest golfer of the late nineteenth and early twentieth centuries. As onee of the all-time greats he graced these shores on many occasions including the first professional championship at Portrush in 1895, Newcastle in 1898 and again in Portmarnock in 1899 and 1910. Along with exhibition matches and course designs he also came to Ireland to recover from his well-documented illness, the so-called white plague (tuberculosis) which at the time was near fatal. A list of the events he played in Ireland are summarised below. 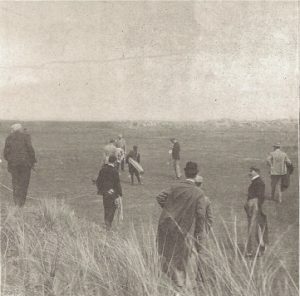 1901 – Professional Golf Tournament – Royal Dublin Golf Club, Dollymount. 1906 – Believed to have designed the Lisdoonvarna course while convalescing from his illness in County Clare at the Thomond House Hotel which was being opened as a sanitarium. On doctors orders Vardon had already spent the first three months of the year in La Touquet, France so it not really known if this was part of his recovery process. On 10 July 1906 the Lord Lieutenant, who was staying there together with his wife the Countess of Aberdeen, drove on the links as a formal inauguration of the golf course and was immediately followed by Harry Vardon. 1907 – Exhibition match – Braid played a match against Harry Vardon on 23 May 1907 to commemorate the opening of Malone’s new eighteen holes. During the practice round Braid shot a 71 to beat Harry Kidd’s, the club professional, course record of 72. 1909 – Exhibition match – Cork Golf Club (David Brown, Lafolley and John MacNamara). Originally he arrived in Douglas to lay out their new course on 20 July 1909. 30 October: Vardon (75 course record – three better than Sandy Herd) and Mr George Combe vs Mr Crichton and Alex Robertson, Vardon and Combe won by 3 and 2 as Robertson wasn’t at his best. 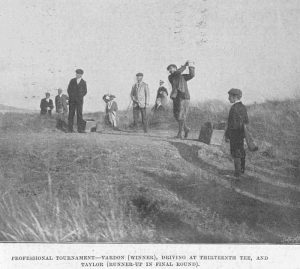 30 October: Lord Annesley and Vardon vs Mr D. W. Smyth and M. Moran but match abandoned on the 12th due to torrential rain. 31 October: Vardon and Mr Robinson (won 2 and 1) vs Moran and Mr Whyte. 1 November: Vardon (72) would team up with Patrick O’Hare (won 3 and 2) against Michael Moran and A. Robertson ( 74). 1 November: Vardon (76) would team up with Robertson (won 6 and 5) against Michael Moran (pulling shots badly) and Mr John Ball. 4 November Vardon to play an exhibition match at Holywood against Harold Reade and G B Long and got the better of them. 1927 – Exhibition match – Bundoran Golf Club (Easter) – Vardon had been engage to help with the course design. 1927 – William Robinson was a fine “scratch” golfer partner Harry Vardon in a match against Alex Herd and John Hamill played at Bangor. Vardon is considered to have designed Bundoran, Douglas, Delgany, Dunfanaghy, Lisdoonvarna and Rosapenna. In Easter 1927 Harry Vardon was invited to play an exhibition match at Bundoran partnering Jack Smith, an English professional, against Willie Nolan and Holley. While the Holley/Nolan partnership lost by 3 and 2 the approximate scores showed Holley played the best golf of the fourball, his 71 was two shots better than Vardon and Smith and three better than Nolan. Vardon was likely in his fifty-sixth year at this stage and well past his prime but still managed a very respectably score.